We have gotten as far north as Sarina, which is just south of Mackay, and we’ll break up our long stints of driving by calling in on local friends. 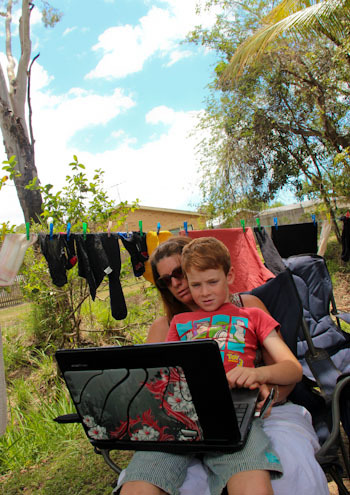 Lisa and David Wood are a travelling family with five boys — four who currently live with them in their housebus. A year ago, we met David and the boys, and during today’s visit, we finally caught up with Lisa while David was at work! 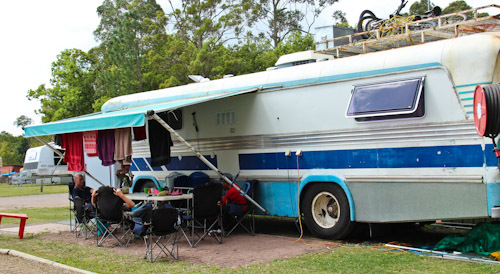 We first met the David Wood and his boys in September 2011 at Yandina on the Sunshine Coast. 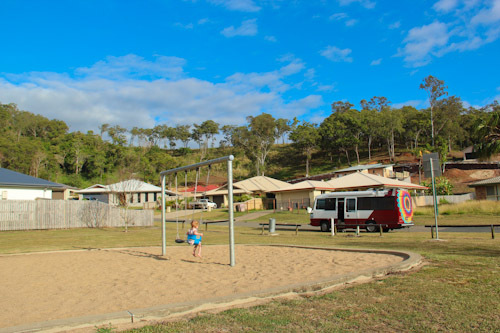 Last night, we park next to a playground around the back of the caravan park where a travelling family is currently living. 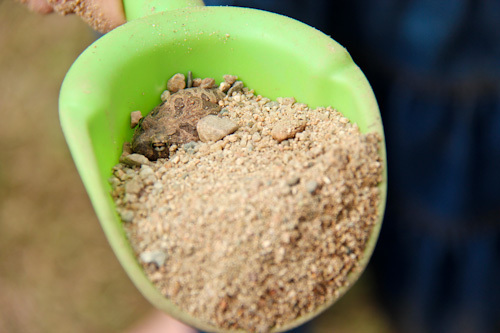 While digging in the sand, the girls unearth a well-camouflaged toad! We follow Lisa and her boys back to their bus which is currently undergoing the prep-work necessary before a new coat of paint. 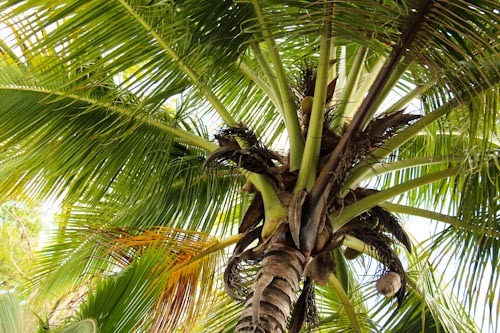 The bus is surrounded by coconut trees. 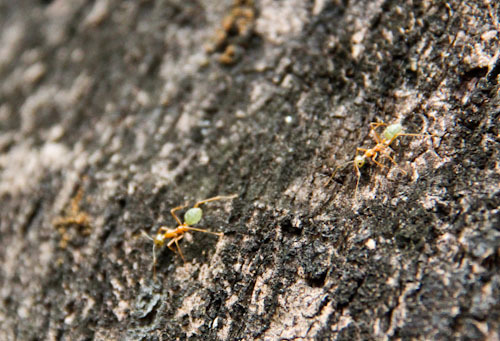 Biting green ants inhabit the trees around us, and I get one in my eye when I try to knock a coconut down from a tree. 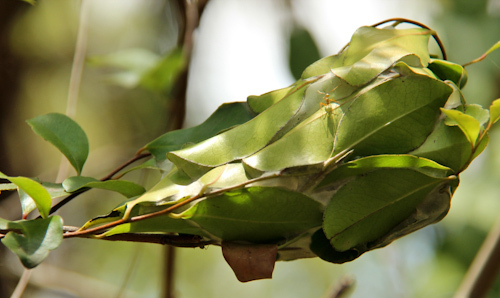 The green ants weave together leaves to make their nests in the trees — much like the red ants I grew up with in West Africa! It’s lovely to be up in the tropics. So much of it reminds me of West Africa where I grew up. Our girls are still acclimatised to the cooler New Zealand temperatures, so they’re not enjoying the heat — except where it means swimming! 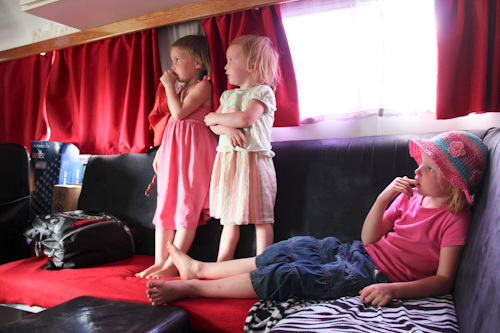 Once in the bus, the girls start watching a dolphin movie they've never seen before. 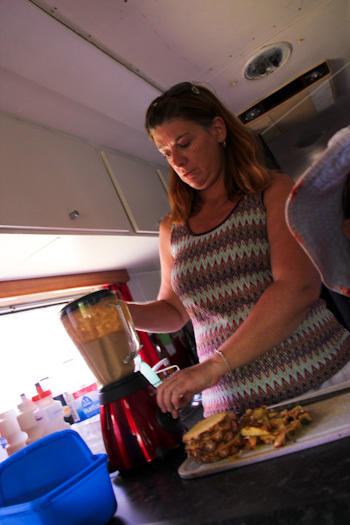 Lisa makes fresh fruit smoothies for us all to enjoy. 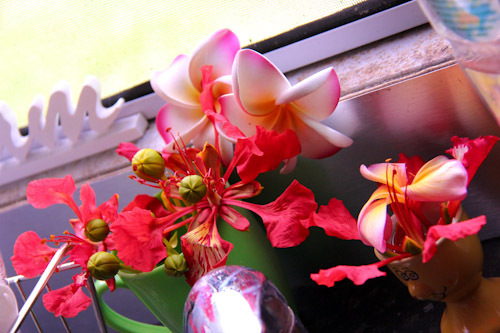 Fresh flowers in the bus kitchen are a lovely reminder that we're now in the tropics! 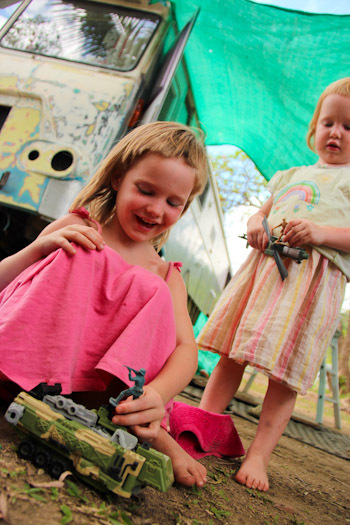 Calista and Delaney enjoy playing with the boys' toys as Lisa and I sit outside and talk. This is what homeschooling looks like for many families — Kyle sits on Lisa's lap and gets her instant help as he plays a game. Lisa and David have been asked to move the bus from where it is currently parked. I know from experience that transition can be painful, but upon later reflection, we need something to incite us into a new position that will stretch us into more godly beings. The trick is to learn to embrace changes before they are forced upon us! 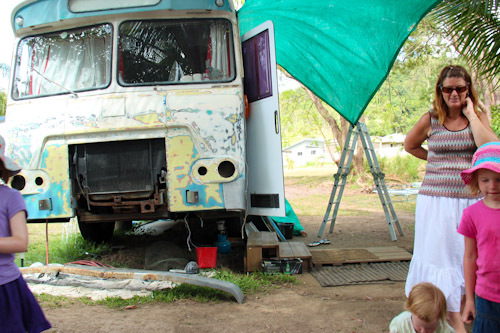 I look forward to following Lisa and David’s story as they continue finishing their bus and resume their travels. It will be lovely to meet them on the road someday in the future, though I have no idea what that will look like! Thanking you so very much for stopping in and spending time with us.